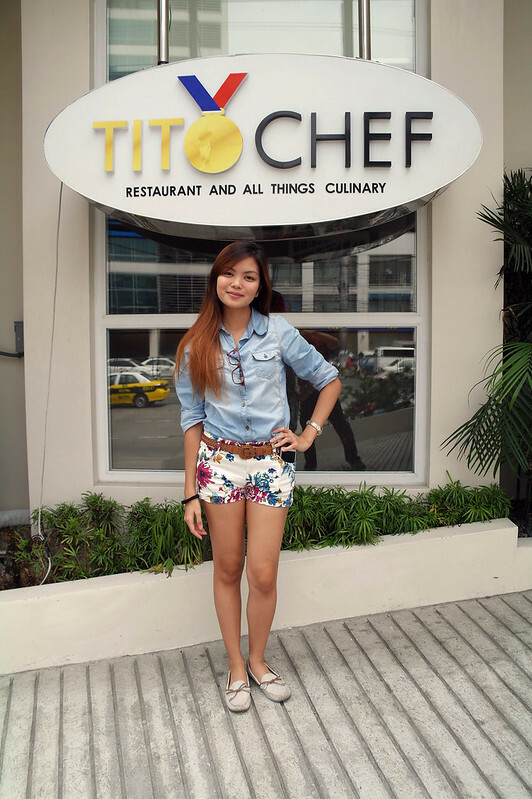 Birthday girl standing outside Tito Chef. 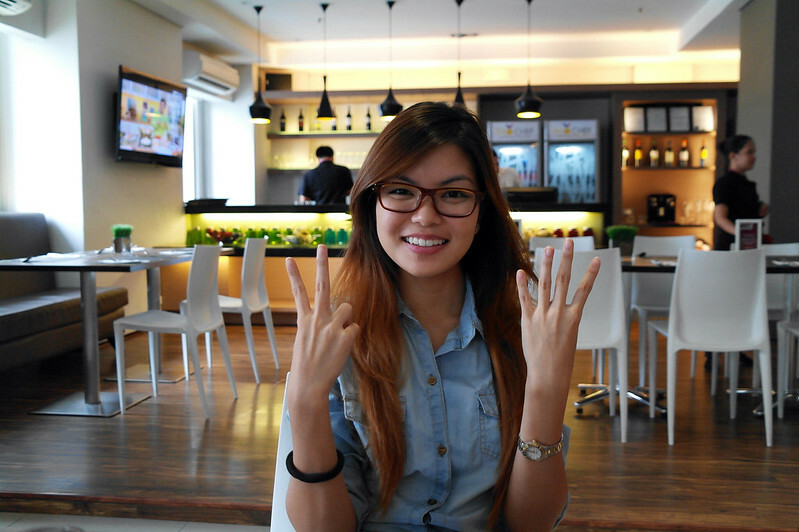 For my 24th birthday last Thursday, August 8, my family and I wanted to have a nice lunch out somewhere new. As we were heading out, we remembered a picture my uncle posted on Facebook of a nicely plated dish, so we asked him about the restaurant. He had good things to say about the place and the food, so we decided to see for ourselves. Tito Chef was originally started and is still located in Sucat, Parañaque by Chef Menoy Gimenez and his culinary team. The name first reminded me of another restaurant called “Lolo Dads”, and it turns out the restaurant name also sprouted from a pet name because Chef Menoy’s nephew would fondly call him Tito Chef. After a considerable amount of success down South, Chef Menoy finally decided to bring his and his team’s culinary skills to a freshly-opened branch in my very own Quezon City. View of the restaurant from the Microtel lobby. The bar and service counter. Photo op with the statement chair cannot be passed up. 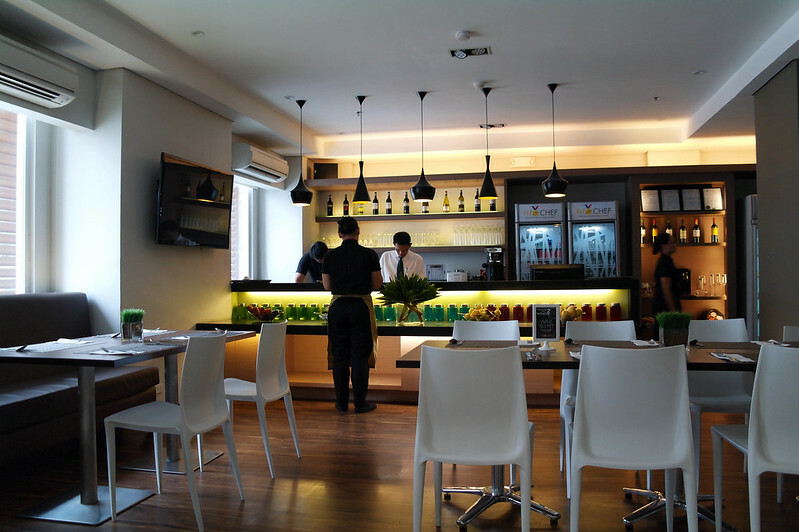 Tito Chef’s interior is simple, modern and spacious. The restaurant is differentiated from the Microtel lobby only by those white criss-cross dividers behind the statement chair. Between the windows facing the street are LCD TVs that run cooking shows, and I do regret not taking a picture of the opposite wall, because that one displayed abstract paintings. I’d say the ambience is good for all types of gatherings, whether it’s a date, barkada food trip, business meeting or family lunch. On to the food! Bacalao & Artichoke Chowder: Creamy spinach salt cod potage with artichoke hearts. We ordered 2 kinds of soup. The Bacalao & Artichoke Chowder (Php 120) was good. Although I feel most people would find too salty of a start to a meal, I consider its dried fish taste to be what makes it a distinct dish. Even though I did grow a little bit tired of it after several spoon fulls, the added texture of the Picnic-like shredded potato made it interesting. It does make a world of difference too to squeeze a bit of lemon into it. The serving is just right for one person, but if you’re with at least one more person, you can order another type of soup so you two can have a bit of both without feeling too bloated for the main course. Truffled Mushroom Puree: Mushroom melange of shitake, oyster, and porcini pureed and finished with truffle oil essence. Now, the Truffled Mushroom Puree (Php 150) I really liked. 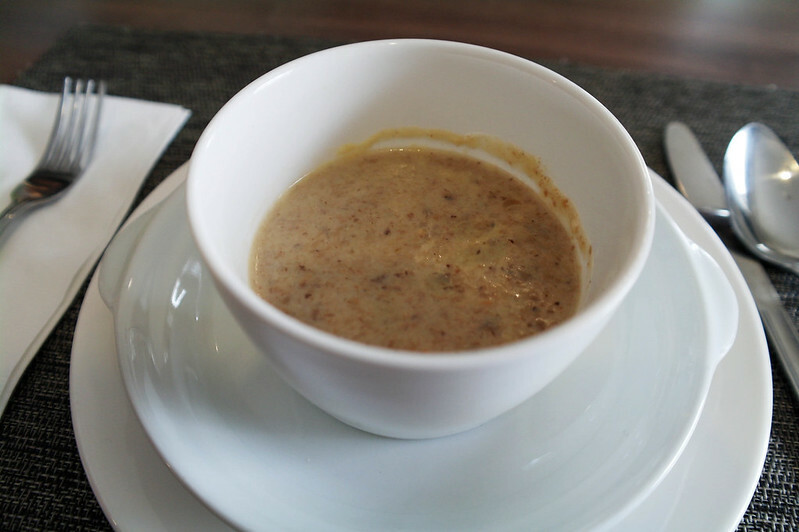 It actually redefines your standard of how a Cream of Mushroom soup should be. It’s light, comforting, and a good contrast to the strong flavors in the Bacalao & Artichoke Chowder. 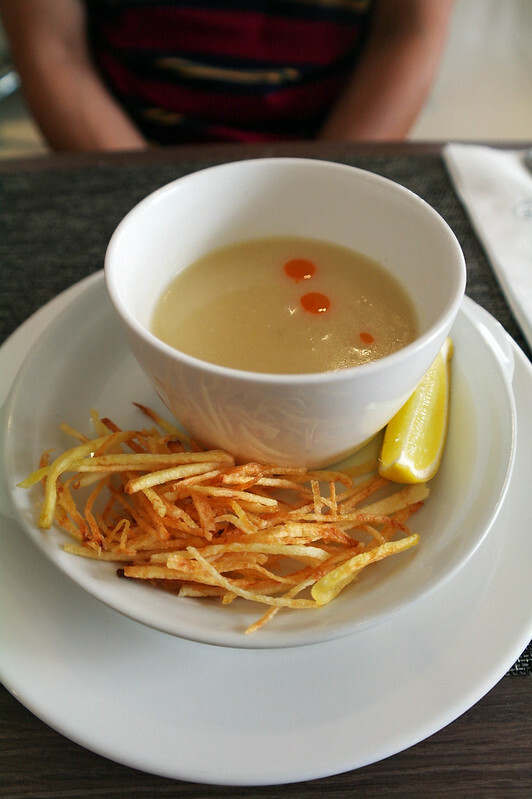 Not that it matters much, but this soup’s plating could’ve been prettier. Salmon Tartare: Fresh cut chilled salmon in a Dijon mustard dressing with crème fraiche, caviar & herbs. 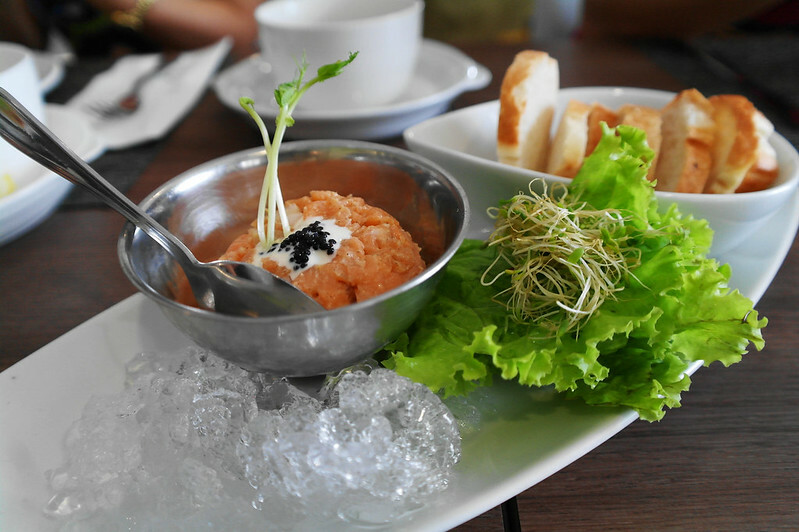 I was actually craving for some sashimi prior to going to Tito Chef’s so I wanted to order the Salmon Tartare (Php 280). It was okay. I was hoping the salmon would leave a fresher, cleaner taste on the palette, but it felt a little gritty and needed a bit of lemon (leftover from the Bacalao & Artichoke Chowder) just to bring out more flavor. If you’re squeamish about the fishy taste of caviar, the lemon will help neutralize it for you. 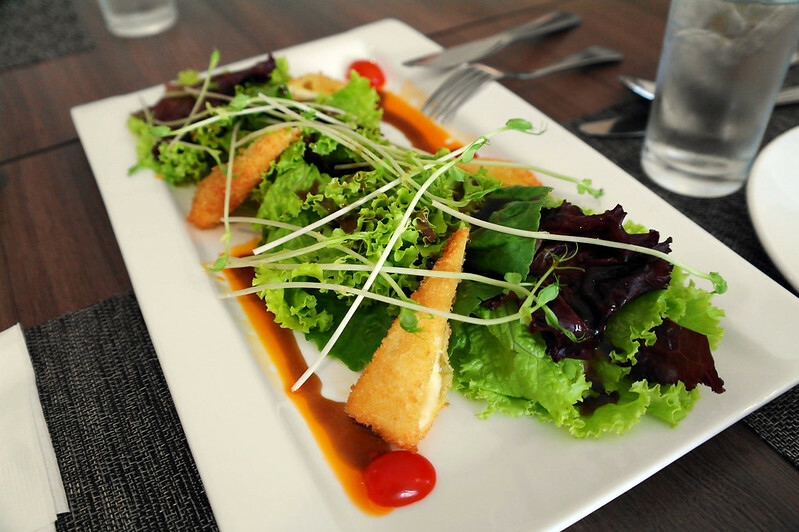 Water Buffalo Cheese Salad: Breaded fresh water buffalo cheese served with mesclun greens, tomatoes, and citrus & balsamic vinaigrettes. We got the Water Buffalo Cheese Salad (Php 250) because we love vinaigrette-based salads, and simply because kesong puti rocks. The cheese was pleasantly mild and had the right amount of crunch to go well with the greens and the tartness of the dressing. Now, I can eat a mountain of salad on my own, but if you’re sharing with 1-2 more people and you’re expecting your entrees to be heavy, this serving is just right. 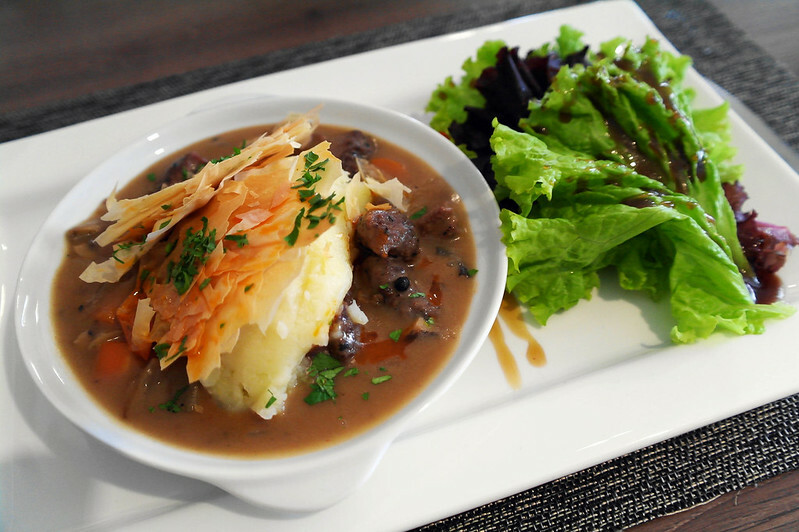 Steak & Mushroom Pie: Tender braised cube steak with mushrooms, vegetables & gravy, served with warm creamy potatoes and petit green salad. My sister’s Steak & Mushroom Pie (Php 395) was like good comfort food! I’d want this served to me after a long, hard day with probably a glass of red wine or a beer. The steak was melt-in-your-mouth soft, and they were swimming in gravy that wasn’t at all overpowering. 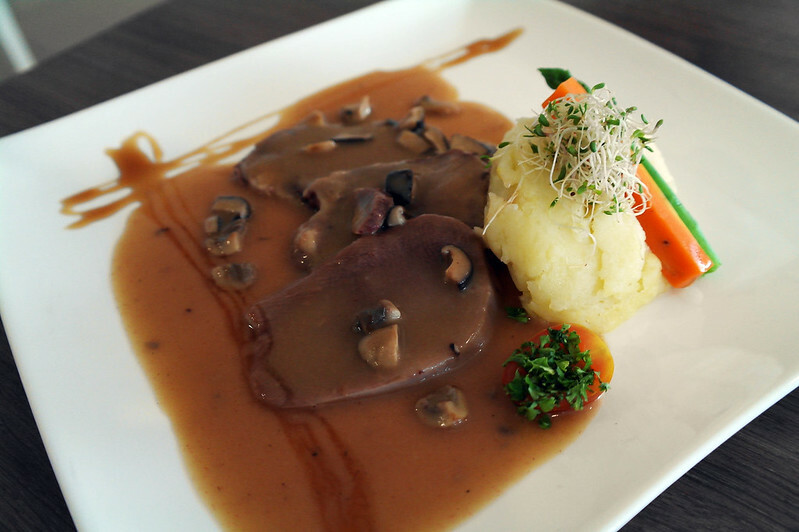 Braised Ox Tongue: Tender Ox tongue stewed in a rich bordelaise sauce served with mashed potatoes. The Braised Ox Tongue (Php 350) was good as well, but I feel Lengua is always going to be one of those dishes no one can really majorly go wrong with. It’s a plus that the sauce made it taste a little different from the usual Spanish preparation, but for this price, I’d recommend you order something more adventurous. 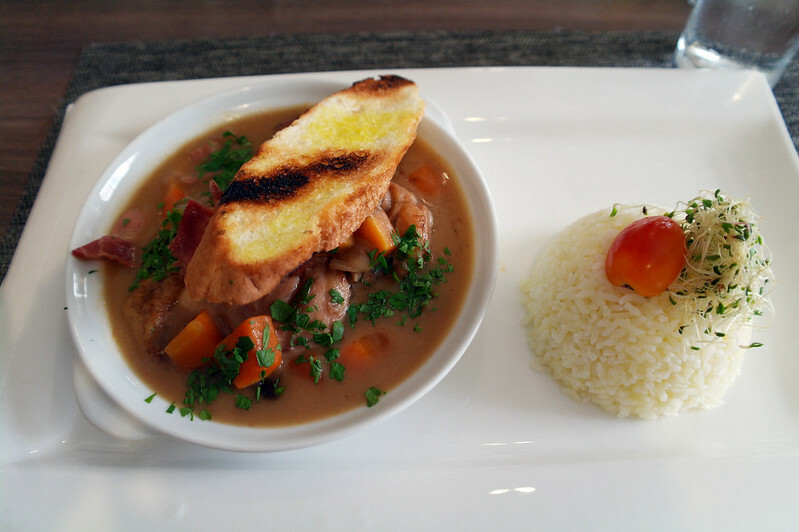 French Chicken Stew: Red wine & demiglace stewed chicken thighs with bacon, mushrooms and aromatic vegetables, served with rice pilaf. I actually also wanted the Steak & Mushroom Pie my sister ordered, but because my boyfriend told me he was taking me out to have steak for dinner, I opted for the French Chicken Stew (Php 325) instead. Yummy! The chicken was soft and flavorful, and it’s a good idea to dip the toast in the gravy. Only thing I didn’t like about this dish is that the bacon ended up making the gravy too salty. Osso Buco Milanese: Fork tender beef shank stew served with gremolata, Milanese style risotto, & asparagus. 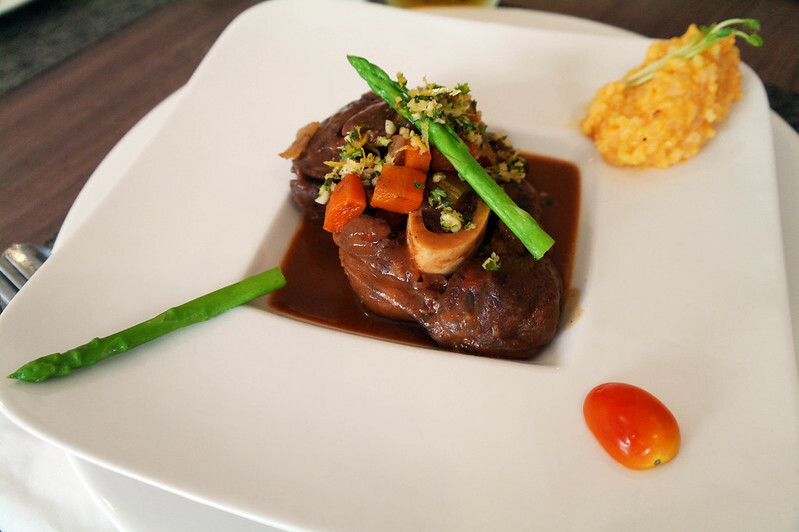 Meet the grand winner of the entrees ordered – the Osso Buco Milanese (Php 465)! This dish was, by far, the most delicious of the bunch. The price may be a bit intimidating, but trust me, it’s worth it. The beef just surrenders to slicing and has soaked up a lot of flavor, and goes perfectly with the risotto. This was my dad’s order, and his only comment was that he wished there was more risotto, but that he would actually order this again if he found himself back at Tito Chef. 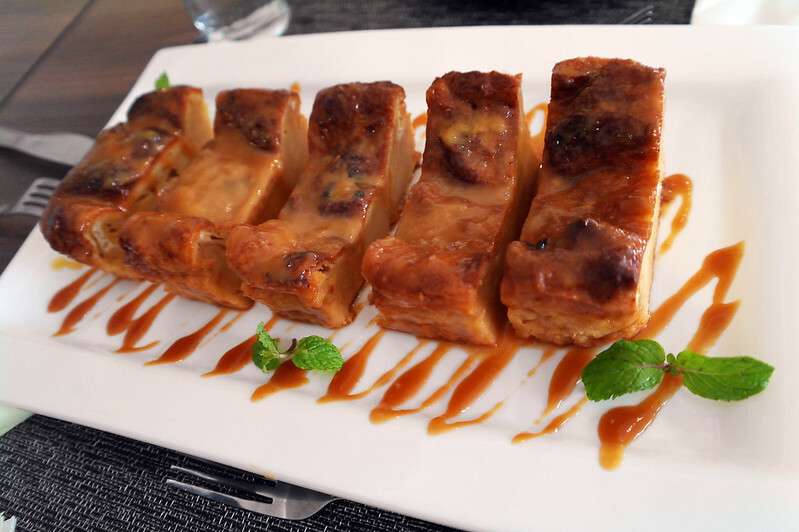 Brioche Bread Pudding: Soft vanilla custard soaked bread topped with a buttery caramel sauce. Best eaten warm. A closer look at a slice of the Brioche Bread Pudding. 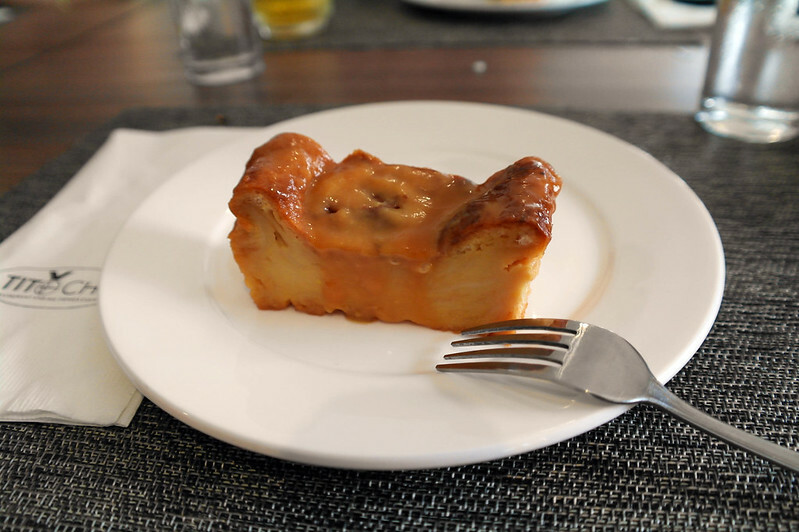 For dessert, we decided to just split a whole loaf of the Brioche Bread Pudding (Php 285). So good. If you’ve been to hotel buffets, then you probably already know what this tastes like. This one earns plus points for the bread’s texture, and the caramel sauce. It tastes very indulgent and rich, so if you’re trying to cut back on that sugar, go easy on this one. Despite being a bit pricey at around P500-600/head, I don’t regret having my birthday lunch at Tito Chef. Food tasted and looked great, and because we were the only ones there on a Thursday afternoon, I appreciated the ambience of the place more. Thinking about it in retrospect, the dishes we ordered all kind of look the same, but you should know they all have a distinct taste. If there’s anything I’d recommend from Tito Chef, it would be the Osso Buco Milanese. 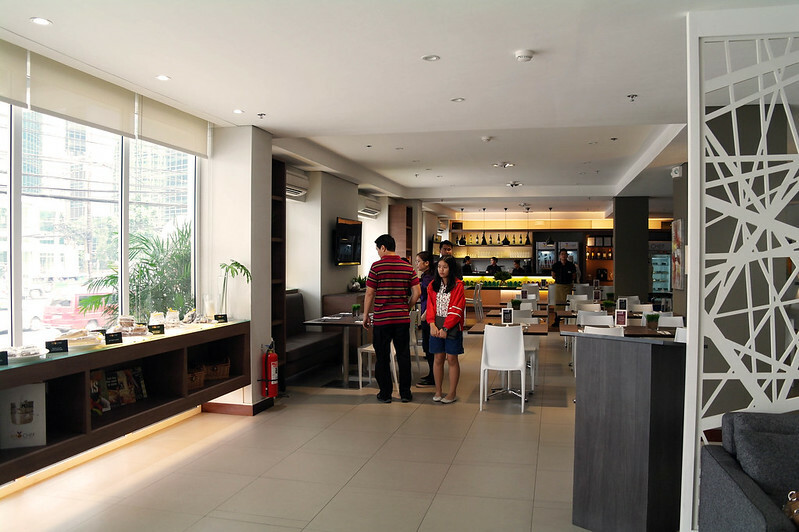 Tags: Food, Microtel, Quezon City, Restaurant, Review. Bookmark the permalink.